Viva Cell- MTS General Manager Ralph Yirikian and Fuller Center for Housing Armenia President Ashot Yeghiazaryan with the Khamoyan family. 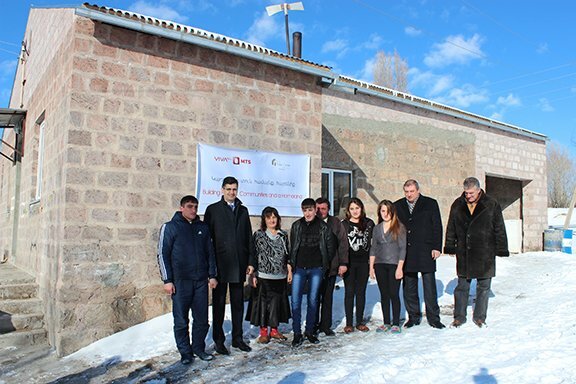 SHGHARSHIK — Due the partnership between VivaCell-MTS and Fuller Center for Housing Armenia, the construction of a half-built house and renovation of roofs of two houses was completed in the Shgharshik community of Aragatsotn region in 2015. VivaCell-MTS General Manager Ralph Yirikian and Fuller Center for Housing Armenia President Ashot Yeghiazaryan participated in the housewarming ceremony of the happy family and visited the families, who have renovated the roofs of their houses. Last year, the jointly implemented housing project launched with the construction of this house. The Khamoyans have lived in a half-built house for 20 years on concrete ground, without a kitchen or a bathroom. The building that was initially built as a boiling house now has become a decent home for the family. “When I go far back our happiness seems so dreamlike now. Each member of our family wants to be at home each second, enjoy the comfort we were deprived of so many years. Bad housing conditions have affected my children’s health. At least now their health can be secured somehow,” said Mushegh, the father of the Khamoyan family. “The denial of indifference is in the core of this program, which is very close to the system of values adopted in our Company. Anyone left alone with his or her problems and troubles first adjusts to the situation, and as a next step isolates oneself from others. That’s the worst human condition and the society has to avoid it. We strive to be the helping hand, which supports numerous families in getting out of the hard situation. However, we are not almighty. This program sends a message to others not to be indifferent,” said VivaCell-MTS General Manager Ralph Yirikian. “Owing to the housing project 10 families of Aragatsotn region have completed the construction of their half-built house or have renovated their house. For many families the basic housing conditions and the decent home are natural and normal phenomena while for a significant part it becomes a destination for a lifelong struggle leaving the life in the back. For this and other families of the project at least one problem is now solved,” said Yeghiazaryan. To remind, in 2015 VivaCell-MTS invested AMD 100 million for the housing project, and the Fuller Center for Housing Armenia has undertaken the implementation of the project. Due to this partnership, since 2007, 93 families have benefited. VivaCell-MTS… You know that you can! Fuller Center for Housing Armenia is a non-governmental, charitable organization that supports community development in the Republics of Armenia and Artsakh by assisting in building and renovating simple, decent and affordable homes, as well as advocating the right to a decent shelter as a matter of conscience and action. FCHA provides long-term, interest-free loans to low-income families. The monthly repayments flow into a Revolving Fund, which is used to help more families, thereby providing a financial foundation for sustainable community development. Since 2008 the Fuller Center for Housing Armenia has assisted more than 450 families.